Kata is a Japanese word used to describe a detailed choreographed set of movements. I used to teach the art of Tai Chi Chuan. It is originally a Chinese martial art that centers around the practice of a particular kata or form. This form is a series of movements that flowed from one to another. When all the movements were combined it produced a beautiful and elaborate “dance” that exhibited power, grace and technique. The world of bodyweight calisthenics is changing. I believe people are getting sick of spending money at the gym and pumping iron the way Arnold and Jack Lalanne used to do. They are looking for alternatives. Yet is the answer found in doing a bunch of push ups and no-weight squats? Calisthenics skill-based exercises have grown in popularity. People like Hannibal for King, Denis Minin and Hit Richards have found large followings because they can do planches, handstand push ups and front levers (and of course because they have great physiques). But is this the extent of bodyweight calisthenics…cranking out a bunch of super challenging moves? Sure its inspiring to see a bunch of dudes in the park doing something like this… but what’s next? I think a small niche of people is forming that desire more than just to be able to do a planche or muscle up. I think that the attraction to bodyweight exercises is that there is a sense of mastering oneself. And being able to conquer one extreme move is great but combining them into a full form where you move from one challenging move to another is even better. For example, see the video I created below. At the beginning I start off in a handstand on the parallettes. I then transition into a L Sit and then transition back to the handstand. I am going through P2 right now and by no means am I saying that I am proficient at this. But by going through the program a new world is opening up to me where I realize that I could create a full 20-30 minute form where I practice extreme calisthenics in a similar way that I used to practice Tai Chi. Imagine a form or series of movements that incorporated movements such as handstands, planches, front levers, muscle ups, double levers, pistol squats, one arm handstands, and more… all combined into one long sequence or kata. The movements and maybe more importantly the transitions would help build tremendous strength but the benefits wouldn’t end there. It would also incorporate the principles of Chinese internal martial arts such as flow, breath control, balance, whole body unity, energy control, yin/yang, rooting, etc. It would be a combination of internal martial arts and western strength calisthenics. Aren’t you simply describing Yoga? No, I am not. Yoga is a practice that DOES incorporate bodyweight exercises and meditative principles but I am talking about something different. Take a look at this video of a woman doing Tai Chi. The fluidity and distinct energy control are two of the hallmarks of this art form. I would like to push the Western skill-based calisthenics movement toward this direction and challenge it to adopt even greater principles of breath control, fluidity, energy use and transition between each skill. Below is a video of where we are CURRENTLY at as an industry. We have gone far but its time to push to the next level. Let us work toward even greater mastery of our own bodies. “Empty your mind. Be formless, shapeless—like water. Our strength practice can go beyond a series of movements. It can become art. It can become a dance of extreme movement that is as beautiful as a ballerina and as strong as a Tsunami. I am currently putting together sequences of beginner and intermediate moves that are challenging and incorporate principles of Tai Chi. 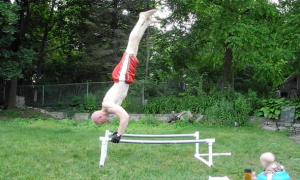 For the comments: Do you think western calisthenics should adopt the principles of the east? Why or why not? You are right about the evolution, but I think we are already there. Is it mainstream? No, it is very hard, as it is said all the time: “how many people do you see in the gym doing pull ups… Not much, because it is hard” or something along this line. Anyway, you can already see it for sometime now already, in Scott Sonnon’s work, the bodyweight coach\shapeshifter guys work and GMB’s work. Totally agree with you that it is not mainstream and that we will be there quickly. In other countries (Ukraine, Lithuania) there are bodyweight competitions but here in the U.S. there are just a few. What I am referring to in this article goes beyond the typical bodyweight stuff (including my stuff too). I am referring to incorporating energy practice into extreme calisthenics. I think we are “here” in terms of movement and ability but not in terms of bringing eastern principles into our “gymnastics” style movement. I agree with your sentiment here of incorporating eastern principles of energy manipulation. I’m a huge fan of Ido Portal. He teaches movement based flows. Ido is one of my favorites. He has tremendous ability and is a fabulous teacher too. I think your idea is phenomenal! Please do keep us posted as to how this may evolve. I don’t know if you have ever read the Dune series, but what you have described sounds a lot like the “Prana Bindu” techniques they use to strengthen and align the body’s muscles properly. In so doing gaining the total mastery over their bodies you spoke of. I also thought it sounded a lot like doing Yoga, but like you, I also thought that Yoga seemed to lack something. I cannot wait to hear when you have the first beginners form ready! The Prana Bindu thing sounds very interesting. I found some very short snippets online about it but do you have any other sources where I can learn more? There’s something like this in The Kingkiller Chronicles by Patrick Rothfuss as well. Not sure if it’s in the first or second book, but I believe it’s the second. More focused on fighting though. The indication of mastery is being able to perform the ‘kata’ very slowly while still keeping the stances perfect and stable. Adds strength to otherwise weak stances and attacks. Lets say you want to make your kick more powerful. Instead of kicking normally over and over, you instead move through the motion as slowly as possible, putting strength into the whole motion. More emphasis is put on awkward and otherwise unstable points in defense and attack. For instance the point where your leg is fully extended into a kick and your back and supporting leg are twisted. Practice that slowly until you can do it at a practically glacial pace, and where others might be easily thrown or pushed over, you will be fully stable. I have a simple question for you. How much time it took you to master the calisthenics. I’m refering to moves like muscle ups, front lever, human flag etc. I think you are getting somewhere really neat, Todd. I am anxious to see some of these sequences. I have recently watched many capoeira videos, and I was amazed exactly by the beautiful way they can control their bodies. I understand that by saying “my vision…” you were not claiming to have the ultimate truth. And i understand aswell how passionate you are for eastern philosophy. 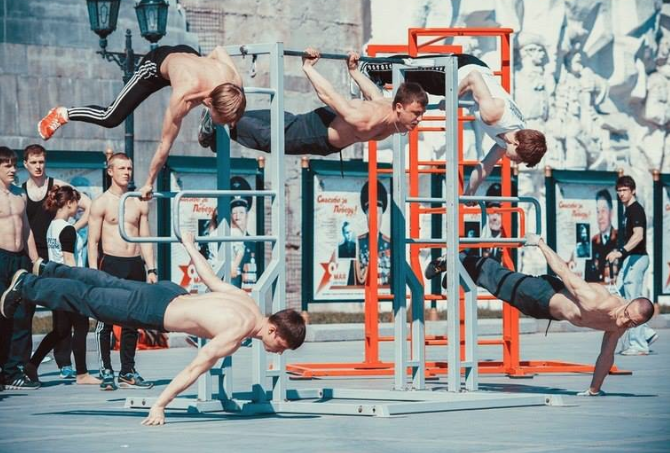 However, although it (calisthenics) can become a “philosophy of life” for some people and, consequently, develop a branch related to this principles that you mentioned, it would have changed into something different from calisthenics. Lots of people (like me, for example) have worldviews in which there is no room for eastern philosophy. I, to be honest, have an aversion to it. The practitioner who wants to introduce his epistemological beliefs can do it on his own. Excited for the beginners tai chi-ish moves! I’m intrigued, but not quite sure what you mean. Taiji quan is a soft, internal martial art that focuses on intrinsic energy. The flow and connection of each movement to the next is an expression of this internal energy. On the other hand, body weight training certainly has an external focus to it, so combining the two … seems more equivalent to a kata form (such as in karate… an external martial arts form). I don’t think I’m just splitting hairs here; there’s a qualitative difference that has to do with mindfulness and focus (IMHO). I see this as the next level for sure. To take popular bodyweight workouts say in a boot camp setting and build foundations with great workouts and develop bodyweight skills. Then from there people can have this option to continue their training and challenge themselves to move to the next level. Certainly not for everyone but that’s what the boot camp is for then you skim the cream from the top and take those few to a much higher level. It just needs structure and measurable results to keep folks interested and improving. Todd, I think that adopting the principles of what Bruce Lee quoted and going beyond just some body movements is right on!!!! Thanks for this great article and keep up the great work and research that you do!! Hy Todd.It is very good what you are duing.Sorry for my bad english.I am a guy from Roumainia that now lives in Germeny.I d´ont now how i found you but i am very happy that i did.I have all the 38 resources from top bodyweitght experts and i lovit.From the information that was ther i have made my own Diet plan an a litel workout.And I simpli love your work!!! And now whitt this idea what you whant to akomplish its absolutly great!! !I cant wheyt !!! I’m not very far along in my bodyweight training or proficiency, however this approach would have tremendous appeal and value to me. I wonder if it could also be done at a level closer to the mainstream public in addition to an advanced practitioner level. Very, very, I mean very interesting view on calisthenics! Awesome Rafael! I’ve been continuing to play around with these ideas. when you put a bunch of guys in a park and form a crew , they imitate their references, as you say, even those led by their egos , to my calisthenics is like a dance , also like yoga, I consider myself an explorer movement , as I say , when these kids realize that calisthenics those caught in that scene ruled by the street workout world wide movement and be stagnant because of these patterns and the lack of exploration of the medium ( displacement ) or animal movements and other disciplines are able to combine and fully open to a new experience, the experience of being ! Hi Todd! It is good to see that the art of body building is getting back to basics! Bodyweight Calisthenics has long since been forgotten by the disciples in the light of new training methods. However, what feels great is actually the old training methods getting their due respect and reputation once again. I would like to tell you something about me. After school, I had always wanted to look great and since lifting weights was the in-thing around those days, I jumped straight into it. Saw slight gains in myself in 2-3 months of workout… but I was never really consistent in it. I used to quit the gym within the span of 3 months. tried it 3 times. Never really satisfied. Always got bored. I regret not listening to my father who always used to say, “Lifting Weights will not give you the strength you’re actually capable of. It will just make you look big and strong, but you will never be as strong as you can be really.” He used to stress on bodyweight exercises, and how I should go about them. Finally, after 7 years, I decided to just jump into it. I mean, after all, a father is bound to send his kid on the right path!! He’s not much of a fitness freak himself. I started out with 0 pull-ups. Slowly and gradually, I kept moving, one step at a time. The best thing about Calisthenics is that unlike lifting weights, you do not get bored! It has been more than an year since I am training keeping the basic calisthenics movements in the core of my workout routines. Strict Pull-ups, Handstand Pushups (supported), Hanging routines such as leg raises, toes to bar, Back Lever etc… I am not just doing them, I am enjoying it like anything! Almost as if I was a 5 year old kid hanging on a monkey bar!!! 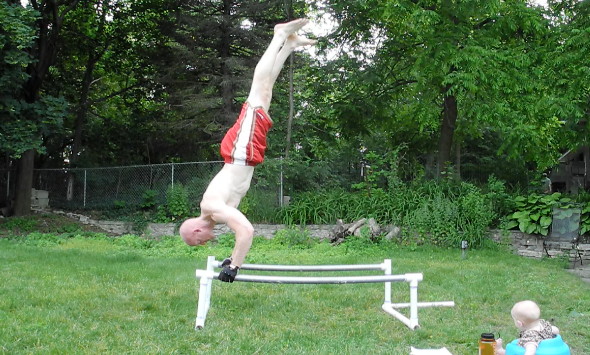 Calisthenics has changed my POV towards fitness and strength training. A minor internal injury in the neck while attempting a Neck Bridge is a bit of a setback that I have hit 20 days ago, and I am just waiting for the pain to go away before I can start it again! Calisthenics is the way to go!!! Overload it with free weights and you’ll shoot to superhuman strength gains in no time!!! That’s what my future plan is. And yeah, Supplementation of Yoga Asanas within the training routine is needed I feel, because I believe that is how I will lose the support from my handstands! Way to go Todd!!!!! Keep inspiring the world!